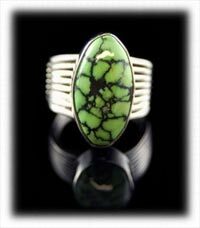 Lime Green Turquoise is very popular for its bright color that stands out in Southwestern Jewelry. The lime green color also goes great with other colorful gemstones such as Coral, Spiny Oyster, Lapis, Sugilite and even Sleeping Beauty Turquoise. 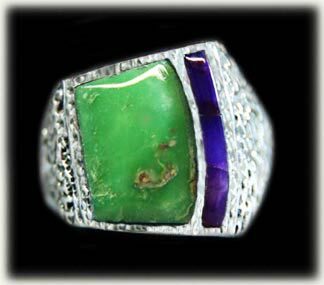 Lime Green Turquoise is one of the most desirable colors in multi-colored Inlaid Jewelry as well. 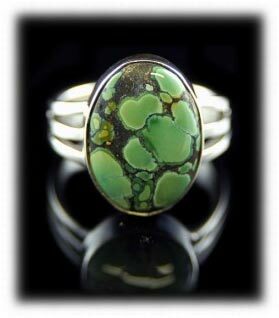 It is truly a beautiful gemstone and is also a rarity for Turquoise to be Lime Green. Lime Green Turquoise actually lacks certain minerals (mainly copper) which is the reason it is colored lime green. 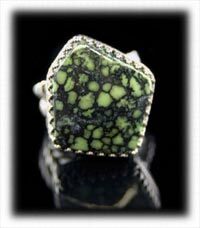 There are other gemstones such as Faustite, Calcasiderite and Variscite that come close to Lime Green Turquoise but they are not actually Turquoise. Above is a collage of Lime Green Turquoise mixed with blue hues of Turquoise from the Carico Lake Turquoise Mine in Nevada. It is clear to see the beautiful color range Carico Lake Turquoise has and you can see the Lime Green color range from this Turquoise Mine. See more on Carico Lake Turquoise below. Lime Green Turquoise - There are many shades of Green Turquoise which predominantly comes from Nevada in the United States. Lime Green Turquoise is the most recent color that has become popular in the American market. 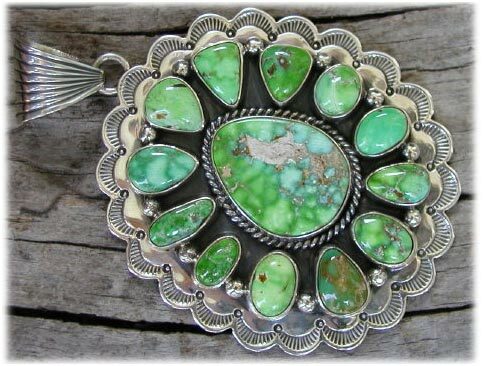 Turquoise Jewelry manufacturers that made Inlaid Turquoise Jewelry and various bead makers of Santa Fe adopted Lime Green Turquoise to use in combination with other uniquely colored Gemstones such as Sugilite, Spiny Oyster Shell and Sleeping Beauty Turquoise to create an exciting new look in the Southwestern Jewelry market. Above are examples of Orvil Jack Turquoise; In the photo to the left is an actual picture of a vein of Orvil Jack Turquoise in the ground. 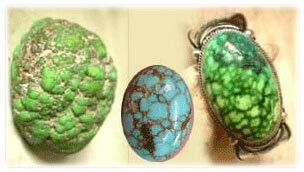 The center photo is a genuine piece of natural Orvil Jack Lime Green Turquoise ready to be cut into a cabochon or bead. In the photo on the right is a ring produced by Durango Silver Company that is inlaid with authentic Orvil Jack Lime Green Turquoise and Lapis. 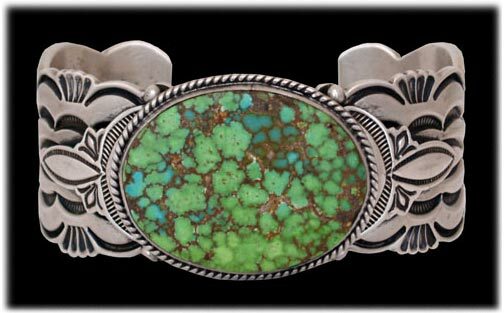 This is a photo of an Orvil Jack Inlaid Turquoise Bracelet. The Lime Green Turquoise makes this bracelet stand out from all others when worn by its owner. Finding a bracelet of this quality is difficult and you will pay a mighty price to get it. If you could buy a bracelet like this at any price, your investment would be solid and this mine has been closed for over 30 years and the demand for Orvil Jack Turquoise is exponential. Lime Green Turquoise from the Orvil Jack Turquoise Mine was discovered by handmade bead makers in the Santa Fe, New Mexico area in the early 1990’s. When they added it to their “Treasure Necklaces” it set off a new and exciting demand for multi-colored Gemstone Jewelry. Multi-Colored Southwest Jewelry Designs took off like a Freight Train and a new era in Southwestern Jewelry began. Multi-Colored Gemstone Jewelry with the use of Lime Green Turquoise grew quickly and soon the manufacturers of Inlaid Turquoise Jewelry adopted this new style into their designs as well. 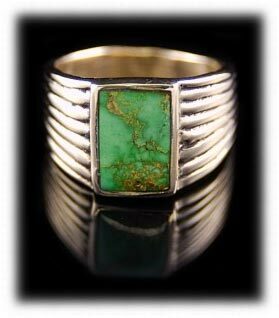 This beautiful Orvil Jack Turquoise Mens Ring in 14k Gold was made by Dillon Hartman of Durango Silver Company. Dillon and John Hartman had to good fortune of procuring a great collection of Orvil Jack Turquoise in 2008. 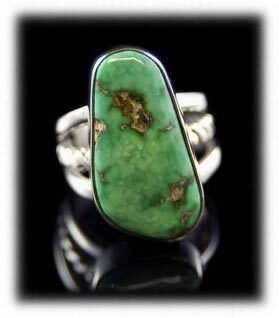 This is a very nice example of Orvil Jack in a beautiful Mans Turquoise Ring – One of a Kind! Demand for Orvil Jack Lime Green Turquoise has gone through the roof. There is one problem, the mine has been close for over 30 years and there never was much lime green Turquoise, it was just a byproduct that was discarded. When Orvil Jack was mining in the 1950’s, he was after blue Turquoise and when he ran into the lime green he thought it was junk so he hauled it down the road and dumped it. In the 90’s someone, while driving down that road notice the lime green color and rediscovered Orvil Jack Turquoise long after the mine had closed. Orvil Jack Lime Turquoise, needless to say, is now very rare and almost non-existent. All Turquoise Mines in Nevada have variables and different mineral deposits, this is what makes Nevada Turquoise so unique with such a wide variety of colors and matrix. 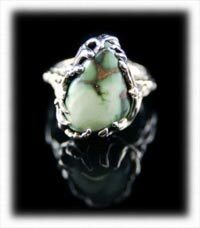 In mining Nevada Turquoise, it is very noticeable that as you move away from the core of the main Turquoise deposit, certain minerals that made the Turquoise diminish and the colors of the material naturally changes. In addition, with the absence of certain minerals the composition of the gemstone found may no longer be Turquoise. There are a variety of gemstones that can be found near Turquoise deposits such as Varisite, Faustite and Calcosiderite which range from brown, yellow, green to lime green in color. 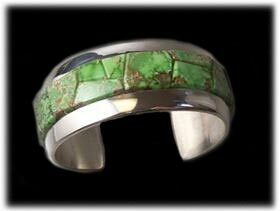 Lime Green Turquoise has been found at many of the Nevada Turquoise Mines of the past, unfortunately it was not popular in the past and was discarded as there was no market for it. A major share of these old Turquoise Mines have long been closed and/or no longer exist. 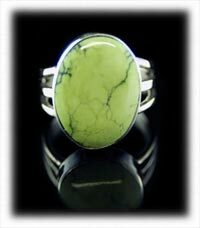 This is a piece of Lime Green Turquoise in a ring produced by Durango Silver Company. Dillon Hartman cut this cabochon from a piece of Turquoise that came out of the Tonapah Blue Gem Mine in the 1950’s. This Turquoise is hard and ran in the same host material as other pieces he had cut that ranged from deep blue, medium colored green to this color of lime green. It is not common for Lime Green Turquoise to come from the Blue Gem mine. This stone is super, super rare, infact it is so rare that most people do not even know about it. The lime Turquoise from the Blue Gem mine all came out of thin viens approx. 1/8th of an inch wide. All of the lime green Blue Gem Turquoise we have cut has been highly silicated making it very hard and glassy. Most of this Lime Green Turquoise has a golden yellow/brown matrix to it and some of it has a gorgeous water web to it as you can barely see in the ring to the right. It is unmistakably Blue Gem as it came out of a prominent old Turquoise collection and all of the Turquoise was consistently Blue Gem material. These four pieces of Jewelry were produced by Durango Silver Company. The stones were mined and cut by John and Dillon Hartman and is from the Tortoise Turquoise mine, which, is located near Mina Nevada. Mina is north of Tonapah Nevada and this is an area that produces mostly green Turquoise. The Tortoise Turquoise Mine has Turquoise and Variscite deposits and produced mainly greens with some blue. Here are two Damale Turquoise Rings made by Crystal Hartman from Durango Silver Company. The stones were cut by John and Dillon Hartman and the material was purchased from Tony Cotner, which is the owner of the Damele Mine. The Damele Mine produces Turquoise, Variscite and other materials. Turquoise and other gemstones have been mined from this location for over 50 years and small amounts are still being taken out annually. The Damele or Damele mine produces some of the best Lime Green Turquoise. These two pieces of Jewelry feature Stennich Turquoise Stones that were cut by Dillon Hartman to Durango Silver Company. The Stennich Turquoise Mine produced Turquoise in the 1940’s to 60’s and has been out of production since. This mine was known for producing a lot of beautiful blue Turquoise as well as green. Here are two other examples of Lime Green Turquoise from Nevada, origin not certain. 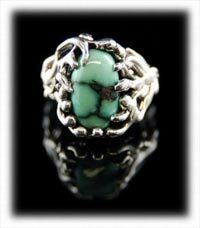 The ring stone was cut by Dillon Hartman of Durango Silver Company and the beads were purchased from an old and prominent Turquoise collection of a Reno, Nevada Jeweler. Both pieces of Jewelry display bold lime green color and were taken out of Nevada Turquoise Mines in the past, probably in the 1940’s to 60’s. This photo has a Carico Lake Turquoise nugget of the grade that the cut stone on the right was cut from. The brialliant lime green is almost shocking to the eye which is what is in high demand for 2010. Turquoise of this grade is hard to find and it fetches quite a chunck of change. The Carico Lake Turquoise Mine is no longer in production which ensures a good investment as it will become more rare as time goes on. The Carico Lake Turquoise Mine also produced Lime Green Turquoise and was re-opened specifically to mine for this color of Turquoise by Ernie Montoya of Albuquerque, New Mexico. Ernie is the owner and founder of Sunwest Silver Company, he is an important person in the world of American Turquoise and a scholar in the field. Ernie reopened and mined Carico Lake Turquoise for several years, at an unimaginable cost. Due to new mining restrictions and the general cost of mining in the United State, the Carico Lake Turquoise Mine has once again closed. High grade Lime Green Turquoise from this mine is beautiful and now becoming a rarity. The six cabochons above are from the Carico Lake Turquoise Mine. Looking at the photo in the top of this web page shows you the rough material it was cut from. The Carico Lake Turquoise Mine produced mostly blue Turquoise with a small percentage of green to lime green in color. This is a good, hard Turquoise of great quality, in general. The highest quality being rare and valuable today as well as a wonderful investment for the days and years to come. 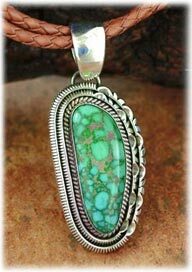 This is a Navajo made multi-stone Carico Lake Turquoise Pendant. It was produced recently (2009-10) and displays a variety of cabochons from the Carico Lake Mine. 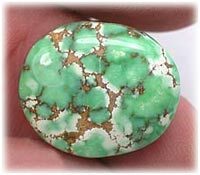 The center stone has lime green coloration running into sky blue which is very attractive and desirable by Turquoise collectors. Matrix in Carico Lake Turquoise usually runs from a sandy blond to dark brown in color and spiderwebbed as well as water webbed Turquoise is found in this Turquoise. The ring at the right is a Navajo Turquoise Ring featuring Carico Lake Turquoise. Notice, this is a fairly clear Turquoise stone indicating it came from a larger nugget – generally, spiderwebbed Turquoise comes from smaller nuggets of Turquoise. Again, a beautiful piece of Carico Lake Turquoise. The color of this Carico Lake Turquoise cab is yet a different color of Lime Turquoise and shows the vast variety of colors of lime green Turquoise that comes from the Carico Lake Turquoise Mine in Nevada. Quite a bit of the Carico Lake Lime Green Turquoise came out in nugget form. These nuggets are great to cut in half and make a high dome freeform cabochon such as the one in the ring to the right. 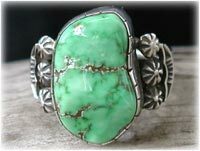 Below is an outstanding piece of Inlay Turquoise Jewelry. The center mosaic stone has been inlaid with Carico Lake Turquoise, Lapis, Coral and Opal. It is paired with Lapis heart cabochons and small Gaspeite stones on the outer edges. It appears that this bracelet was made by the Aldridge family of Durango Colorado. The Aldridge Company uses a lot of Carico Lake Turquoise and produces high quality and colorful Southwestern Inlaid Jewelry. This beautiful Navajo made Turquoise Pendant has a water webbed Carico Lake Turquoise Stone. The webbing in this stone is particularly beautiful as it is lime green on a sky blue background. Each Carico Lake Turquoise rock and cut cabochon is an individual and its beauty is in the eyes of the beholder. To me, this stone displays a unique beauty that was naturally produced by mother nature. Something really wonderful about the Carico Lake Turquoise mine is the fact that it produces these wondeful lime green "water web" stones that combine a sky blue with mint green and lime green Turquoise. This coloration of Carico Lake Turquoise is definately my personal favorite. 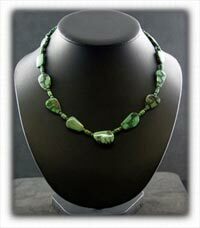 What a wonderful Native American made Lime Green Turquoise Jewelry example! This is a beautiful Navajo Turquoise Bracelet made with a unique spider webbed Carico Lake Turquoise Gemstone. The stone is enhanced by great silver work which is profusely stamped and reposed. Navajo Jewelry of this quality and with Carico Lake Turquoise is difficult to find, it will prove to be a great investment in the years to come. Carico Lake Lime Green Turquoise has some of the same characteristics as Orvil Jack and produced some outstanding specimens. 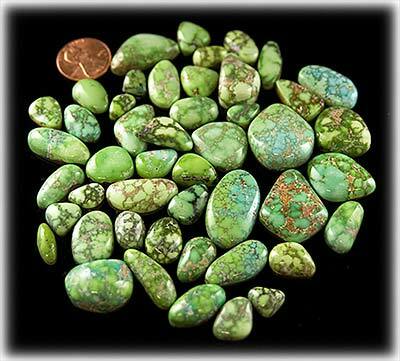 Lime Green Turquoise Nuggets found at this mine produce multi-colored and even spiderwebbed gemstones that are fabulous! A very small amount of Turquoise was found in fossils which is very rare and Lime Green Turquoise Fossils have also been discovered at the Carico Lake Mine which are extremely valuable to collectors do to their extreme rarity. 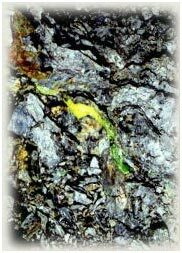 There are various deposits of Lime Green Turquoise throughout the Nevada Mining Districts, however, it is sparse and truly a rarity. Each area produces different colors of Green Turquoise which people call lime green but the true producers of the bold Lime Green Turquoise were the Orvil Jack and Carico Lake Mines. 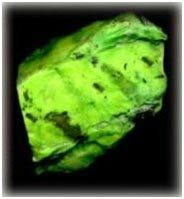 Lime Green Turquoise, Calcosiderite or Variscite has been found near Tonopah Nevada at the Royston Mine, Blue Gem Mine, Tortoise Mine, Miss Moffet Mine, Damale Mine and very small deposits have been found in various other Mines in Nevada. There are no large deposits of Lime Green Turquoise in the United States and this color of Turquoise is very rare, valuable and highly collectible. 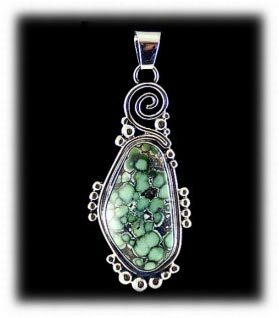 Durango Silver Company and its founders have been Turquoise collectors for over forty years and have the good fortune of possessing Lime Green Turquoise and have even mined specifically for this color of Gemstone. 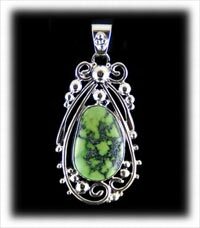 We use Lime Green Turquoise, Variscite, Calcosiderite, Gaspeite and other natural Gemstones that are Lime Green in color in our Turquoise Jewelry on a regular basis. Occasionally and at our will, we use Orvil Jake and Carico Lake Turquoise as a treat for the pleasure of serious collectors of this freak in Mother Nature. 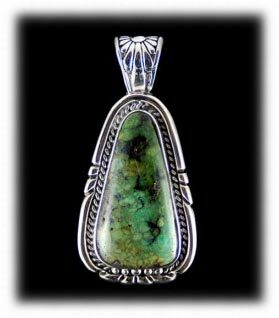 If you are interested in authentic Lime Green Turquoise in Jewelry, visit Durango Silver often or Join our mailing list to be informed when it as well as other rare gems become available. likes to take advantage of the market. This is fine if they sell their goods as what they are, but it is not if they lie to the consumer. Lime Green Turquoise is a rarity and plastic impostors should be considered only for Costume Jewelry which has no collector’s value. 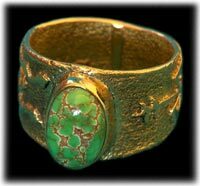 If you fine a piece of Southwest Jewelry with Lime Green Turquoise – Beware! 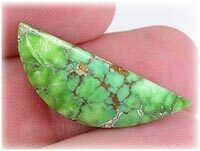 If you are a collector and are buying Lime Green Turquoise for its rarity, only buy it from a reputable dealer that knows their gemstones and can guarantee you the piece is real. Learn more about Lime Turquoise! Most of the photos on this page are our own, however there are a few Lime Green Turquoise photos that were sourced from bing and google images and we are not claiming these photos as ours, rahter trying to provide a diverse range of examples of Lime Green Turquoise. Thank you for reading and learning about Lime Green Turquoise.